This gets 5 stars because I couldn’t put it down and wanted to cancel plans with friends just to finish it. 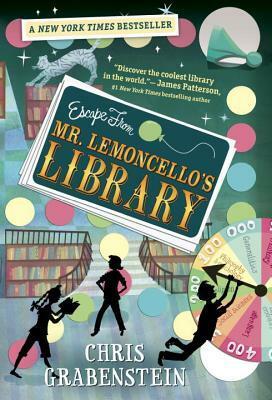 Escape From Mr. Lemoncello’s Library is the modern day Charlie and the Chocolate Factory, just without creepy oompa loompa’s and it takes place in an awesome library. Twelve kids are selected to stay overnight in a library, but little do they know they are being entered into a game to see who can find a way out! Winner gets prizes galore. Like I said, I really loved this one because I was sucked in right away. I think this is one of those rare books reluctant readers would enjoy and get them into reading. The clues and library and book knowledge made this so much fun to read. I need to get more books by this author from the library! 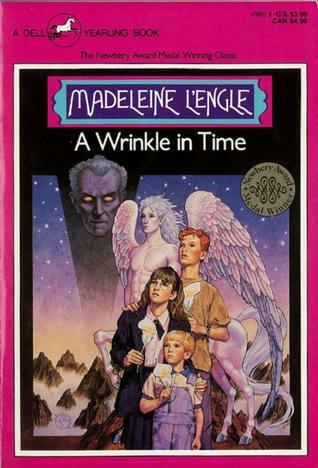 I have to say, I’ve been very skeptical about this book because to me, one of the kids from Glee wrote it. But now I have to say, I am totally impressed! Chris Colfer is a great author! I decided to pick up this book because there is not a day that goes by at my job that I am not asked for a book in this series (seriously, everyday they want The Land of Stories, second only to Harry Potter and Dog Man). That and a recommendation from a friend had me purchasing this from a local independent bookstore. 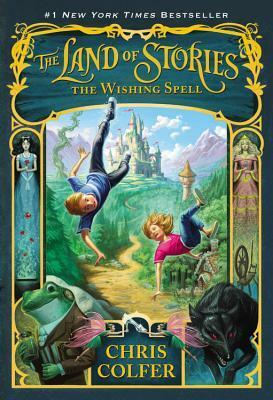 The Wishing Spell is about a pair of 12 year old twins Alex and Conner who after a recent family tragedy are having a hard time coping with their new life. When their grandmother comes to visit them, she gives them her fairy tales book The Land of Stories. But what happens later is crazy, the twins fall into the book and find themselves amongst famous fairy tale characters! They must find a way home, and the only way is to get the wishing spell. I really enjoyed this, I thought it was really cute. I love retellings of stories we all know because I love to see what authors do with the stories and the characters. Colfer has a great sense of humor and a very good voice (by this I mean his writing). He effectively created a cool fairy tale realm with characters we love and made them his own. He could have done a better job with the more action type scenes but this is his first book and I’ll cut him a break. If you have a child in your life, give this to them. Or you can be like me and just read it for yourself with no shame just cause ya want to. Okay, so I’m not THAT old, my mom just bought a lot of books from the local used book store. I read too fast for her to keep up with me, normally it was just library books growing up. Anyways, I digress. 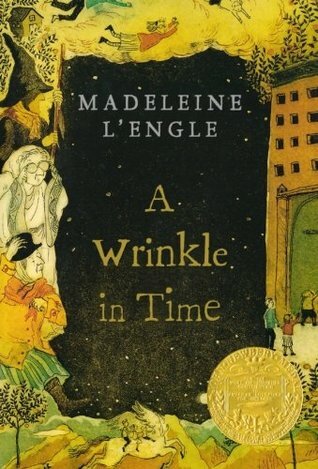 A Wrinkle in Time is about a young girl named Meg, she’s very awkward, has many faults (according to herself) and feels like an outcast. The only people she really finds a comfort with are her scientist mother, and her odd brother Charles Wallace. Meg’s father had also gone missing about two years ago, and while the town suspects he ran off with another woman, Meg and her family know this not to be true. On a stormy evening, Meg and Charles Wallace receive a visitor, the peculiar Mrs. Whatsit. From there, Meg and Charles Wallace, along with a boy named Calvin, get whisked away in a journey to rescue their father. But they must travel through time and space to do so, and face a terrifying darkness to get him back. First off, I have to say, with the few exceptions this book really stands the test of time. It’s not dated at all, and except for the mention of a typewriter, this book could take place during any decade. It’s so rare to read a book written in the 1960’s that’s like that, so a solid kudos to the author. One thing I’ve always loved about the story is Meg, and the idea that she’s not a perfect heroine, and that’s what makes her the hero of the story. It portrays that even though we have faults, sometimes our faults can be our advantage, and that fitting in with everyone else isn’t always the best thing for a society. I love that we have an “ordinary” heroine, who is expected to do extraordinary things, even though she’s not the smartest of the bunch. It’s a bit obvious, being when this book is written, there are some subtext about the dangers of communism. The evil IT and how it makes everyone and everything the same, or else. I think with this subtext, it also portrays how important it is to be an individual and to make up one’s own mind. In a way, this book is very relevant even present day. To fight against what’s wrong and not succumb to forces who want their definition of perfection. Once I was able to put my mind to it, I was able to devour this book in a matter of hours. It’s a very fast read and one I believe all ages can and will enjoy. So I read this book based on work recommendations from fellow librarians. These are the librarians who do not rate high very easily and all of them told me this book was a 5 out of 5. I had ZERO interest in reading this book. I mean it’s historical fiction AND magic realism? Totally not my thing. But I pulled up my big girl pants and checked it out and gave it a chance, and I am so glad I did!!! This book is something else, and I feel all ages could read it. 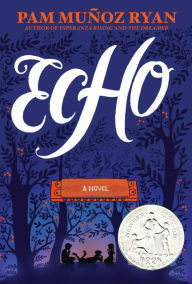 Echo tells 3 main stories: Friedrich, Mike and Ivy. All are children of preteen age, they all live in different times, places and circumstances. We get to read each one of their stories separately, and the power of music is what connects their stories in ways you wouldn’t have guessed. I cannot say much else than that because SPOILERS. What I can say is that from the first page I couldn’t put this book down. The way it’s written and the stories involved in it, it’smagical. I loved the themes, how many of them are still relevant today. The characters felt so real to me, there were moments where I was in great big tears because apparently I am a wuss. This is a book I can see myself rereading in the future and giving it to a lot of kids to read. Honestly, I ask you as an adult to read this book. Or read/give it to the child in your life whether it be your child, niece or nephew, family friend, anyone. I know it’s aimed at middle grade age range but I feel it’s a book any age can love. It’s amazing. I have also had people tell me and read reviews on here where people have said to listen to the audiobook. My friend played me a small bit of the audiobook and I can agree because it plays music that enhances the story.